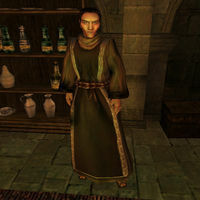 Synnolian Tunifus is an Imperial healer who serves as Lay Healer for the Imperial Cult at the Chapels in Ebonheart. He is one of the people you may talk to in order to join, and he provides some of the easiest quests in the game, all of which involve gathering supplies of various alchemical ingredients. If you happen to have enough of all of these ingredients in your inventory when you first talk to him, you can complete all of his quests in a row without even leaving the room. Like the other early quest-givers in the Imperial Cult, Synnolian is very pushy, and conducts the majority of his dialogue in the form of greetings, so you should be sure you have what he wants before you talk to him, or he will be disappointed in you, and you may lose Disposition with him. In addition to these duties, he also provides potions and spells for a price, whether or not you are a member of the Cult. He also provides some basic information about the Cult and the surrounding areas. "Hello. I am Synnolian Tunifus. I manage the lay healer volunteers for our cult. If you are ready to accept a task as a lay healer, let me know." I'm ready for a lay healer task. [Quality Fortify Strength has been added to your inventory.] "Mara be praised! So much to do, and so little time. Please, bring me five units of marshmerrow for restore health potions. Balur Salvu, a farmer in the western Ascadian Isles, near Pelagiad, grows marshmerrow. Bring him this potion as a gift, and he'll tell you where to pick the marshmerrow." I have something else to ask about. "What was it you wanted?" "Have you brought me five units of muck for cure common disease potions? Or have you come to report your failure?" No, I am still trying. "Very well. Carry on." "Goodness. I was so busy, I almost forgot. Have you checked your advancement in the Imperial cult? As you serve Mara and the Nine, so shall you rise in rank." [4 Bargain Restore a health has been added to your inventory. 80 Gold has been added to your inventory.] "We need five units of muck for cure common disease potions. A farmer in Gnisis, Abishpulu Shand, has a muckspunge patch near his hut, and Chaplain Ogrul at Fort Darius has a deal with Shand to gather muck there for free. Let me put Gnisis on your map. And while you're in Gnisis, visit Chaplain Ogrul and give him these four Restore Health potions. And ask him if he'll teach you a few tricks. When you have the muck, bring it back to me. And here's 80 drakes for the silt strider fare. It's a long walk." [Disposition +5. Potion of Cure Common Disease has been added to your inventory. The Alchemists Formulary has been added to your inventory. Apprentice's Retort has been added to your inventory. 5 Muck has been removed to your inventory.] "I see you have brought me five units of muck. Thank you very much. Here is a Cure Common Disease potion for you, and a copy of 'The Alchemists Formulary', a collection of popular alchemical recipes. And maybe this spare retort will be useful for your potion-making. Practice, practice, practice! Speak to me again when you are ready for another lay healer mission. And remind me to check on your advancement in the cult. You deserve recognition for your labors." "Bring me five units of willow anther for cure paralyzation potions. I am ashamed to admit it, but I steal willow anther from the flowers growing around the house of Gurak gro-Bagrat. His house is on the mainland, just north of the Foreign Quarter. A cleric stealing from criminals to aid the needy... perhaps I have been hanging around Zenithar-worshippers too long." "Have you brought me five units of willow anther for cure common disease potions? Or have you come to report your failure?" "Bring me five units of scrib jelly for cure poison and cure blight potions. The closest reliable source of scribs is the Shulk Egg mine, southwest of Balmora, on the west bank of the Ouadi Oadi, near a swinging bridge. The kwama worker is not aggressive, but the kwama warrior and kwama forager are another matter. Be careful with them. I'll teach you the Detect Creature spell to help you hunt scribs." "Have you brought me five units of scrib jelly for cure poison and cure blight potions? Or have you come to report your failure?" "Bring me five units of corkbulb for cure common disease and restore health potions. The best place to look for corkbulb is the Ascadian Isles, and Arvel Manor in particular. The Imperial Cult has an agreement with the Ascadian Isles plantation owners that permits us to gather corkbulb. The direct route means swimming, so I'll teach you a little spell." "Have you brought me five units of corkbulb root for cure poison and cure common disease and restore health potions? Or have you come to report your failure?" "Bring me five units of rat meat for cure poison potions. The best place to hunt rats is in the underworks of any of Vivec's cantons. Enter the underworks through trapdoors in the canalworks, or enter through the exterior outflow drains underwater along the sides of each canton -- if you don't mind a swim. And be careful. Sometimes bad things -- and bad people -- hide in the underworks. So don't go poking into anything you can't handle." "Have you brought me five units of rat meat for cure poison and cure poison potions? Or have you come to report your failure?" "Bring me one unit of netch leather for cure paralyzation potions. The Ascadian Isles is a good place to hunt. I suggest you start by looking around near Balur Salvu's house. He says he sees wild bull netch all the time. Now, stick with bull netch to start with. The betty netch are rather more dangerous." "Have you brought me one unit of netch leather for cure paralyzation potions? Or have you come to report your failure?" "%PCName. I have no further tasks for you. Did you have a question?" "Hello again, %PCName. I have no tasks for you. Did you have a question for me?" Arvel Manor: "Arvel Manor is just north of the Foreign Quarter, above Dren Plantation, at Arvel Plantation. There's no direct road, so I just swim the lakes. By the way, the Arvels are slave-holders. Remember: slavery is legal here. I don't know how you feel. I don't like it, but as a member of the Imperial cult, I feel honor-bound to respect the law." Ascadian Isles: "It's a land of lakes, farms, and plantations. Lately they've started a few netch ranches. You'll find plenty of marshmerrow, corkbulb, and comberry bush there. Saltrice, too. You can also find ash yam, black anther, gold kanet, green lichen, heather. stoneflower, and willow flower." Balur Salvu: "Balur Salvu's farm is on the road just south of Pelagiad. The farmhouse is north of the road, south of the southwestern end of Lake Hairan. Just head north from Ebonheart. Don't take the bridge west towards Seyda Neen. When you hit the east-west road between Pelagiad and Vivec, turn right, east, towards Vivec, and Balur's farm is not far. If you reach a bridge, you've gone too far. Balur's a shrewd fellow. Ask nicely, and he might share his knowledge." corkbulb: "Corkbulb is a huge bulbous root that protrudes from the ground, with green foliage about man-high. It grows wild, but is easier to find in cultivated patches near the farmhouses of the Ascadian Isles. I think there's a big patch of it just north of Dren Plantation; that's on many maps. And remember: we have an agreement with the plantation owners that lets us collect the corkbulb, so don't be shy." Gnisis: [Disposition ≥ 30.] "Gnisis is a small egg mining and trade village on the silt strider caravan route between Ald'ruhn and the northwest tip of Vvardenfell. It's the largest settlement in the West Gash, with a Legion garrison, Fort Darius, a Tribunal Temple, and a tradehouse. Gnisis is on the north side of the Ouada Samsi gorge; the Samsi runs from Gnisis west all the way to the Inner Sea. To reach Gnisis, take the silt strider from Vivec or Seyda Neen, then transfer through Balmora and Ald'ruhn to Gnisis strider port." Gurak gro-Bagrat: "Gurak gro-Bagrat, netch rancher, horticulturist, and smuggler, lives just north of the bridge from the Vivec Foreign Quarter to the mainland. Everyone knows he smuggles skooma, but he's got friends in the Legion, and Camonna Tong protection, so no one will touch him. Perhaps it is wrong, but I steal willow anther from the willow flowers he grows outside his manor. Be careful. Gurak gro-Bagrat is a dangerous criminal. Under NO circumstances enter his home. Do NOT try to speak to him." marshmerrow: "Tall stalk with triple radiating leaves at intervals along the stalk. Marshmerrow's good for restore health potions. Mixes with corkbulb. And what most folks don't know, corprus weepings also have healing properties." Restore Health potions: "To make a Restore Health potion, combine two ore more of the following cheap and common ingredients in the mortar and pestle: marshmerrow, wickwheat, corkbulb root, and saltrice. It isn't easy, of course. If you aren't very skilled, you will often ruin the ingredients and fail to make the potion. But with practice and training, you'll improve. And a complete set of alchemical apparatus can improve your success rate." Shulk Egg Mine: "The mine is a short distance southwest of Balmora, in the bluffs west of the Odai River. The old suspension bridge across the Odai is just southeast of the mine entrance. A path leads through a break in the mountains from the Pelagiad-Balmora road, but the turnoff isn't marked. It may be easiest to go all the way to Balmora, then head south from the gate near the strider port, climb over the ridge, keeping the river on your left. Watch for the fire of the mining camp at the entrance." Vivec: "Vivec City is the great city in the lagoon east of Ebonheart. Head north from Ebonheart by road, take the bridge into Vivec's Hlaalu Compound, pass through Redoran Compound. From there you can head south to St. Olms and St. Delyn Cantons, or north to the Foreign Quarter. There's a silt strider port and boat dock north of the Foreign Quarter, and guild guide transport from the Mages Guild in the Foreign Quarter." willow anther: "Willow anther is a potent source of the substance needed to make cure paralyzation potions. Corkbulb, netch leather, and scamp skin are also inexpensive materials with these properties."